"ஆடிப் பிறப்புக்கு நாளை விடுதலை,ஆனந்தம் ஆனந்தந் தோழர்களே! கூடிப் பனங்கட்டிக் கூழுங் குடிக்கலாம்,கொழுக்கட்டை தின்னலாம் தோழர்களே!" The month of Aadi is considered inauspicious by the Hindus, which continues till mid of August . But the month of Aadi is considered sacred for Shakthi worship.Aadi Pirappu [ஆடி பிறப்பு] was celebrated (Birth of Aadi month) on this day, making Kozhukattai[கொழுக்கட்டை] and Aadi Koozh[ஆடி கூழ்] and sharing with relatives and friends. 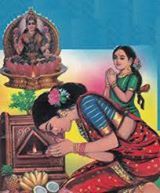 Young women who are unmarried throng the temple especially on Aadi Sevvai[Tues days on July] during the month of Aadi to make vows, fast and worship the Goddess to invoke her blessings to find life partners for them. That is the Tamil month of Aadi (mid July to mid August) is dense with religious and socio-cultural significance. The collective socio-cultural wisdom of the ancient Tamils advised against celebrating marriages during this month so that child birth would not occur during the peak summer months of April, May and June thus ensuring the safety and good health of both the mother and the newborn baby. Moreover, in accordance with this social norm, even other child bearing mothers were also separated from their husbands and sent to their parental home during the month of Aadi. It is highly probable that in order to ensure that marriages would not be solemnized during the month of Aadi, a false superstitious belief was perpetuated that this month was inauspicious for marriages. In spite of the various historical, social and technological changes down the very many ages, the ancient superstitious belief against getting married in the month of Aadi is deeply ingrained in the psyche of even the most highly educated Tamilian.Consequently, irrespective of the religious faith, hardly any marriage is celebrated during the Tamil month of Aadi; this in spite of, all the advances in medical science, which have rendered child birth safe and almost painless.